Data through February 2014, released today by S&P Dow Jones Indices for its S&P/Case-Shiller Home Price Indices, the leading measure of U.S. home prices, show that the annual rates of gain slowed for the 10-City and 20-City Composites. The Composites posted 13.1% and 12.9% in the twelve months ending February 2014. Thirteen cities saw lower annual rates in February. Las Vegas, the leader, posted 23.1% year-over-year versus 24.9% in January. The only city in the Sun Belt that saw improvement in its year-over-year return was San Diego with an increase of 19.9%. Both Composites remained relatively unchanged month-over-month. Thirteen of the twenty cities declined in February.Cleveland had the largest decline of 1.6% followed by Chicago and Minneapolis at -0.9%. Las Vegas posted -0.1%, marking its first decline in almost two years. Tampa showed its largest decline of 0.7% since January 2012. In February 2014, the 10-City and 20-City Composites posted year-over-year increases of 13.1% and 12.9%. “Prices remained steady from January to February for the two Composite indices,” says David M. Blitzer, Chairman of the Index Committee at S&P Dow Jones Indices. “The annual rates cooled the most we’ve seen in some time. The three California cities and Las Vegas have the strongest increases over the last 12 months as the West continues to lead. Denver and Dallas remain the only cities which have reached new post-crisis price peaks. The Northeast with New York, Washington and Boston are seeing some of the slowest year-over-year gains. However, even there prices are above their levels of early 2013. On a month-to-month basis, there is clear weakness. Seasonally adjusted data show prices rose in 19 cities, but a majority at a slower pace than in January. “Despite continued price gains, most other housing statistics are weak. Sales of both new and existing homes are flat to down. The recovery in housing starts, now less than one million units at annual rates, is faltering. Moreover, home prices nationally have not made it back to 2005. Mortgage interest rates, which jumped in May last year and are steady since then, are blamed by some analysts for the weakness. Others cite difficulties in qualifying for loans and concerns about consumer confidence. The result is less demand and fewer homes being built. As of February 2014, average home prices across the United States are back to their mid-2004 levels. Measured from their June/July 2006 peaks, the peak-to-current decline for both Composites is approximately 20%. The recovery from the March 2012 lows is 23% for the 10-City and 20-City Composites. Only five cities saw their annual rates improve in February. After posting annual gains of over 20% for their twelfth consecutive month, Las Vegas and San Francisco both showed deceleration in their annual rates. San Diego narrowed the gap with a return of 19.9%. Washington D.C. recorded its eight consecutive improvement with an annual rate of 9.1%, its highest sinceMay 2006. Thirteen cities declined for the month of February. Cleveland and Tampa showed their largest declines of 1.6% and 0.7% sinceJanuary 2012. Seattle improved from a decline of 0.8% in January to an increase of 0.6% in February. Denver posted a small decline and is less than one percent away from its peak set in September 2013. Dallas increased 0.2% and continues to reach new index highs. Detroit remains the only city below its January 2000 level. 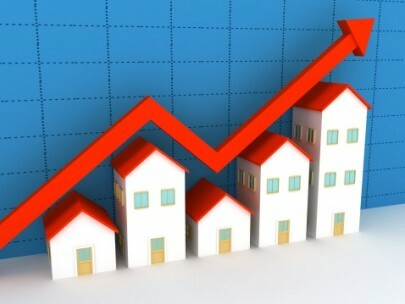 More than 27 years of history for these data series are available, and can be accessed in full by going towww.homeprice.spdji.com. Additional content on the housing market may also be found on S&P Dow Jones Indices’ housing blog: www.housingviews.com. The table below summarizes the results for February 2014. The S&P/Case-Shiller Home Price Indices are revised for the 24 prior months, based on the receipt of additional source data. Since its launch in early 2006, the S&P/Case-Shiller Home Price Indices have published, and the markets have followed and reported on, the non-seasonally adjusted data set used in the headline indices. For analytical purposes, S&P Dow Jones Indices publishes a seasonally adjusted data set covered in the headline indices, as well as for the 17 of 20 markets with tiered price indices and the five condo markets that are tracked.